So rich it could almost pass for a sauce, this drinking chocolate combines South American and Caribbean beans into a deep, complex drink that, frankly, might have you buzzing for a bit. Already a cocoa connoisseur? Opt for something different with the single-source drinking chocolate of the month—in February it’s from Burdick’s nonprofit in Grenada. Buttery, nutty tahini is the not-so-secret secret ingredient in Sofra’s take on the wintertime warmer. But the sesame paste isn’t the only thing bolstering the flavor of this blend of milk and dark Callebaut chocolates. Pastry chef Maura Kilpatrick also relies on an all-important sprinkle of fleur de sel to tie it all together. 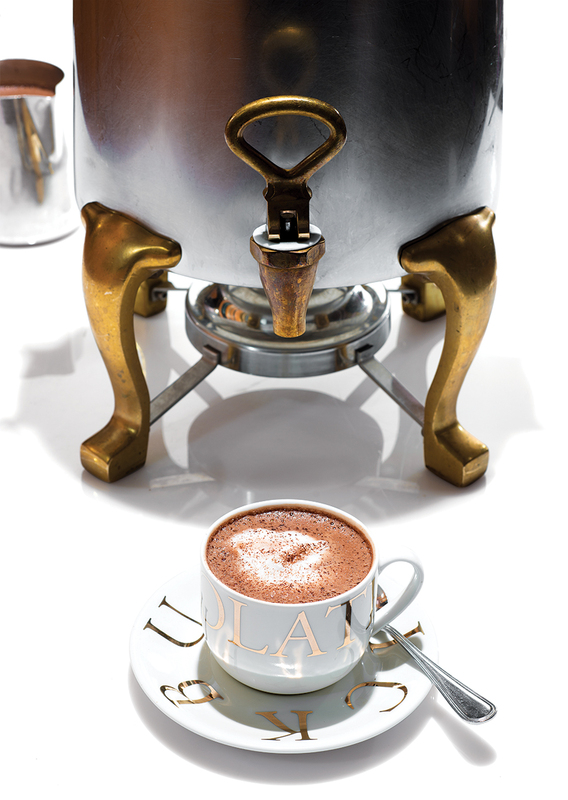 Served for nearly three decades at the Langham Hotel’s over-the-top Saturday chocolate buffet, this dessertlike “soup” is a molten mix of 64 percent Valrhona and vanilla bean–infused milk. Double down on the decadence by piling on toppings like whipped Chantilly cream. Turns out, the Mexican-style stone-ground chocolate bars made by Somerville-based Taza taste just as good in sippable form. At the brand’s Boston Public Market outpost, “chocolate baristas” churn out all manner of craveable cacao drinks, including a must-try Nutella riff with house-ground hazelnut butter. Sprinkles of chili, cinnamon, and cayenne boost the warming factor of this sweet treat. But don’t be deterred by the bold name—it’s more malty-mellow than full-stop spicy, thanks to its rich base of house-made ganache and frothy steamed milk.